On the 18th – 23rd April 2010 union activists from twenty five countries across four continents in the global South, representing democratic unions from the following countries – Brazil, Argentina, Paraguay, Bolivia, Colombia, South Africa, Senegal, Nigeria, Guinea, Kenya, Democratic Republic Of Congo, Sierra Leone, Tunisia, Zambia, Angola, Eritrea, India, Thailand, Malaysia, Indonesia, East Timor, Philippines, South Korea and Australia gathered in Sao Paulo, Brazil on the 18-23 April 2010. In the global south workers in many countries are under attack as we meet both industrially and through civil war. SIGTUR and the meeting recognised their predicament and extended solidarity. One hundred and ten delegates debated and engaged in the deepening global economic crisis manifested in failure of the financial systems, the capitalist restructuring of the global economy and their effects on the global working class, particularly from developing and poor countries and the catastrophic ecological crisis. The congress discussed and conclude the congress Declaration needed a sense of realism. The need to continues our fight to secure global economic justice, congress reconised the forces pitted against us are formidable: free market global capitalism has consolidated the power of multi national corporations to an unprecedented degree. The congress discussed the fact that a mere ten corporations control the sector and of these the top three control 40 per cent of the total. They have budgets bigger than many nation states. However, we also observe that these forces are deep in crisis produced by financial hyper speculation which de-legitimizes capitalism as a system and provides new opportunities for struggle. SIGTUR as a solidarity network is an active and living voice of workers in the global South representing a diverse and broad spectrum of trade unions committed to global economic justice that seeks to inspire ordinary workers to take up and intensify and effective class struggles against the exploitative system of neoliberal globalisation and the increased suffering of workers and communities in all our countries. It aims at ensuring that the voice of workers in the global south and around the globe is not censored or suppressed in whatever form. 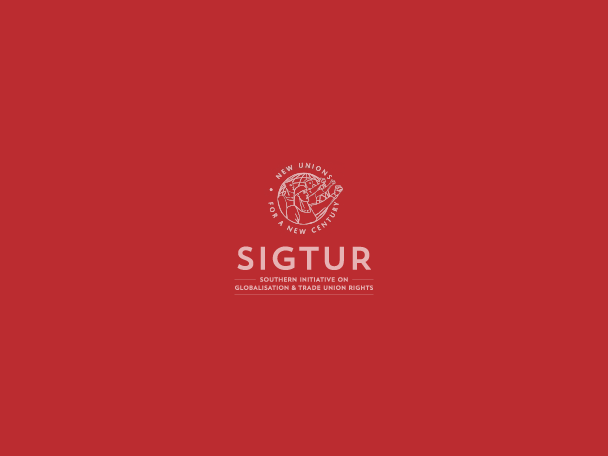 SIGTUR’s primarily emphasis that we represent and support democratic trade unions and their radical struggles for economic justice at national, regional and global levels.